To address the increase of passenger air travel and the potential opportunity for air freight transport business in the region, Cornwall County Council, working with the Department for Transport, embarked on a significant £2.8m expansion programme at Newquay Cornwall International Airport. Commissioned research by the government showed that the airport is expected to see unprecedented growth in passenger numbers over the next few years. This is expected to bring further opportunities for the regions tourism and other businesses. In 2005, Newquay Airport recorded 300,000 people using its services with numbers expected to grow by another 100,000 people in 2006, due to new route operations and the arrival of low cost airline operators. Landside, the scheme has provided passengers with a larger and more comfortable arrivals and departure lounges, increased car parking, improved catering and new bus, coach and taxi stations. To meet the demand airside, the airport required a new ‘Parking Pan’ to cater for larger and consequently heavier aircraft, specifically the Boeing 737 and 767, for over night stopovers and to increase aircraft parking facilities due to the number of planes now planning to operate from the site. The key challenge for the project airside was to complete the works in early 2006 under a restrictive timetable of just ten working days, to meet the scheduled arrival of the larger planes operating from the site. Marshalls worked closely with both the Principal Contactor, Mowlem and specialist hard landscaping sub contractor Anzac, to provide a solution for the new 3,500m2 parking pan in the timescales outlined. 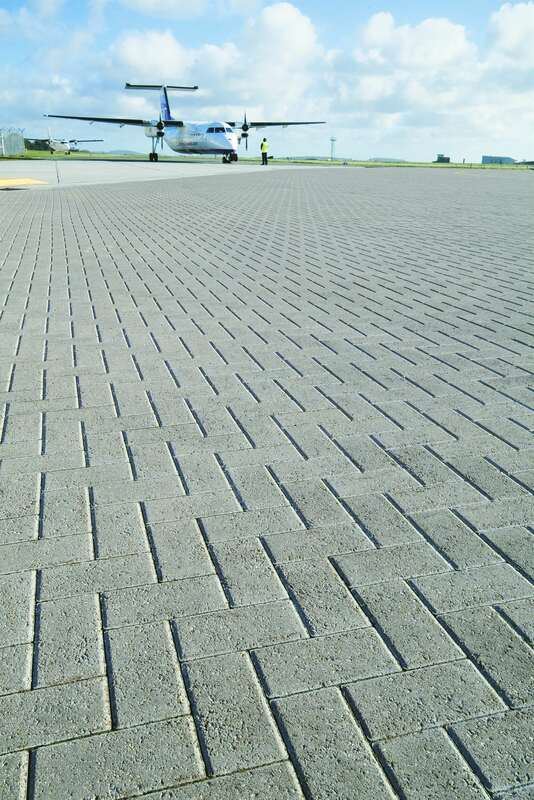 With their wealth of experience in related heavy load areas and airport standings, the Marshalls team specified the use of its trusted Keyblok product and suggested using its innovative Keyblok Machine Lay (ML) Concrete Block Paving for this application. The benefits of using automated handling and mechanical installation methods meant that Marshalls were able to complete the project ahead of schedule, saving time and resources, whilst still maintaining consistently high standards of installation throughout the contract. To facilitate the scheme’s success, Marshalls and Probst, the vehicle and mechanical handling system provider, attended pre-works meetings where ‘just in time deliveries’ were discussed and gave peace of mind to any issues the construction team may have had. To further support the installation both Probst and key Marshalls’ personnel were on-site throughout the project to ensure a smooth installation for project success.